Summary: The Zenbook UX305UA is a sleek 13-inch ultraportable with an excellent IPS matte display, Skylake hardware, a large battery and an affordable price tag. All these taken together make it an excellent buy for those of you looking for a premium device, but on a limited budget. Yet, that's only if Asus sells it in your region and if you can live with its quirks: the lack of a backlit keyboard, the limited IO, the rather noisy fan and a few others that you'll find more about from this article. 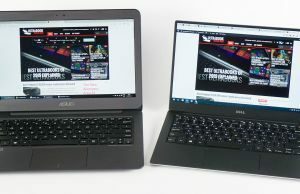 If you’ve read some of my other articles here on the site, you probably know I’m a big fan of compact laptops with matte screens, that’s why my main-driver in the last months has been the Dell XPS 13 with the matte FHD display. 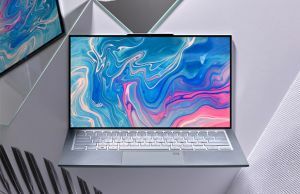 In this post we’re going to talk about the Asus Zenbook UX305UA though, a more affordable alternative for the XPS 13 and overall a solid bundle for what you’ll have to pay for. 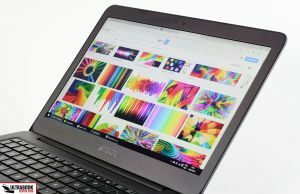 The laptop is not available in the US at the time of this article (mid February 2016), but expect to find it in stores for $799 and up in the future. The Zenbook UX305UA is not a new design, but an updated version of the UX305LA launched in 2015. The hardware was bumped to the latest Intel Skylake platform, but everything else remains the same. 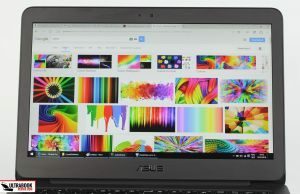 That means the UX305UA is still the same sleek laptop with an excellent display and a large battery, but at the same time buyers will have to settle for a non-backlit keyboard or limited IO. We’ll talk about all these in the post, so stick around if you’re interested in getting one of these Zenbooks. 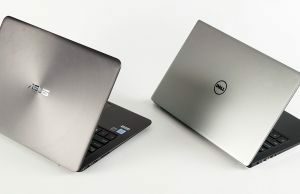 Also, there will be a lot of references and comparisons with the XPS 13, since the two laptops share similar traits and I’m already very familiar with that one. 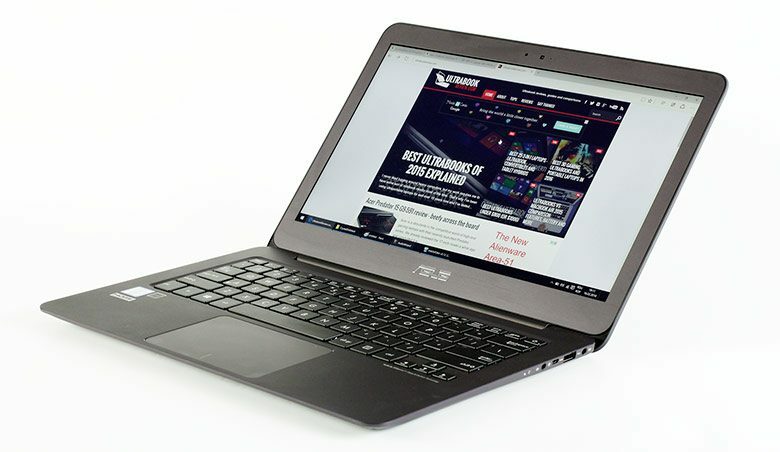 Disclaimer: We tested a retail version of the Zenbook UX305UA, identical to what you can find it stores, provided by Asus for the purpose of this review. We used it for about a week before gathering our impressions here, and then we sent it back. Update: Asus replaced the Zenbook UX305UA with the Zenbook UX306UA as of the second part of 2016. You can find our impressions on the new model here, as well as details on what’s changed. 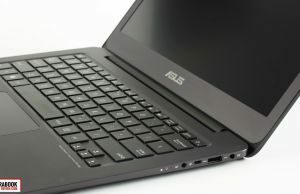 There’s also a slightly fancier successor, the Zenbook UX330, that you might want to read about. 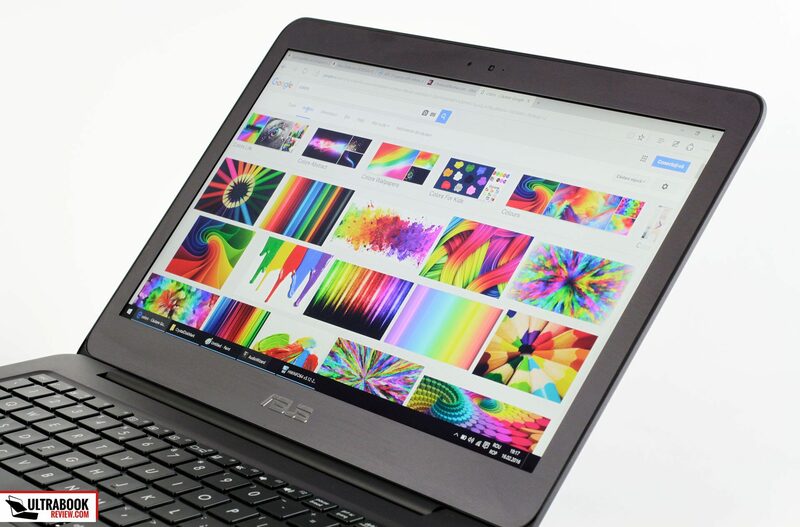 This laptop is thin and light. Not the thinnest or the lightest in its class, but up there with the most portable options. It weighs 2.86 lbs and is just 0.6 of an inch thick, which corroborated with the sturdy build and compact size make it a pleasure to grab along when traveling or in the daily comute. The Zenbook UX305UA is available in two colors. Our test model comes in the darker one (Obsidian Stone), while the other choice is lighter (Aurora Metallic). If you get to choose between them, pick the latter, because the dark variant is a serious magnet for smudges and fingerprints, both on the lid and on the interior. 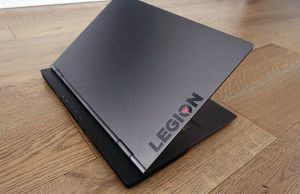 This aside though, this laptop is a real looker and it feels very nice in daily use, pretty much on par with the Macbook Air, the XPS 13 and some of the other premium 13-inchers available these days. It’s sturdy built, with little flex in the hood and in the keyboard-frame, and it’s entirely made out of metal. Well, at least on the outside, as this notebook doesn’t get a unibody construction, thus the inner frame is made from plastic and only covered in metal. 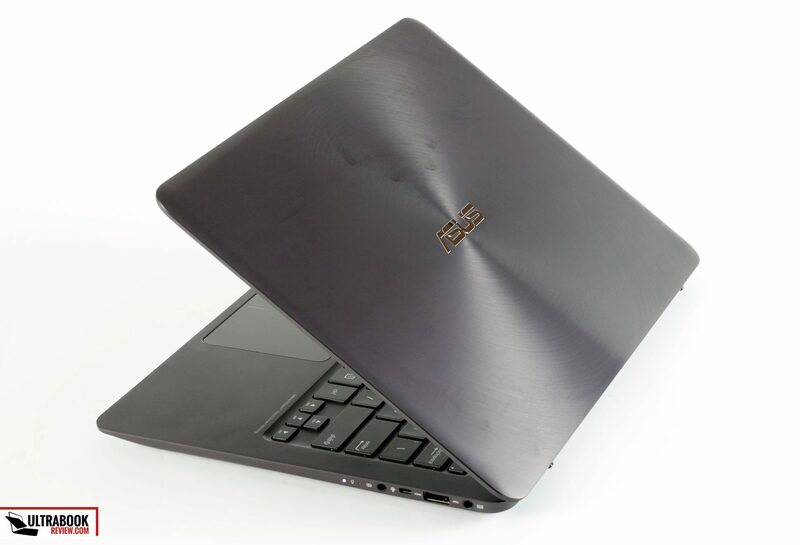 The lid gets a textured finishing, with the ripple pattern around a shiny Asus logo that has been a trademark for Zenbooks since their inception. 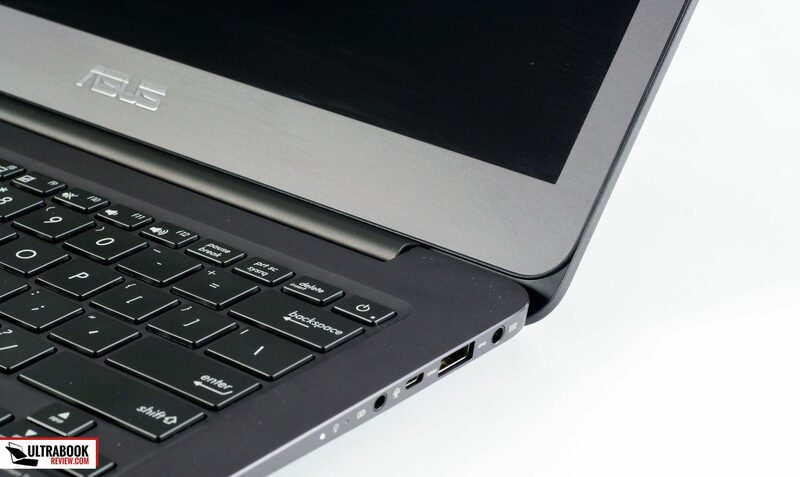 I dig the looks, but it will scratch and dent easily, so make sure you treat the laptop well. Asus includes a pretty good protection sleeve in the pack, so you’ll probably want to use it all the time. The interior is made from a rougher type of matte aluminum, which handles scratches a lot better, but is at the same time more difficult to wipe clean. The underbelly is metallic as well, and down here you’ll notice the two rubber feet which offer decent grip, an air intake grill and the speaker cuts on the sides. Air is sucked from the bottom, so make sure not to cover the grills, and pushed through a grills placed just behind the hinge. Most of the hot air is blown towards the back, but some reaches the screen as well. Back to that interior, you’ll notice there’s enough room for a full-size keyboard and a large trackpad, but also a roomy palm-rest that provides proper support when typing. The design is clean and simple, albeit there are some stickers on the left side which you’ll probably want to peel off. 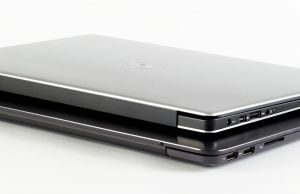 The laptop is friendly in daily use, mainly thanks to its low profile and rounded corners, cause otherwise the edges are rather harsh. Overall though, it’s a pleasure to use this machine. Now, I’d like to to turn our attention onto the screen’s hinge. The UX305UA is not a convertible, thus the screen can only open to around 130-135 degrees. That’s enough for desk use, but limiting if you lean the notebook on your thighs, while laying in bed, which I for one do quite often. My issue is with the hinge’s feel though, and perhaps I’m nitpicking here, but it’s a bit too weak for my liking. It’s true that it allows to lift the screen extremely easily with a single hand, that’s great, but at the same time it doesn’t toughen up once it goes past 90 degrees, so in certain situations the screen just won’t stay as you set it up, which can get annoying. Another aspect to discuss is the IO on the sides. 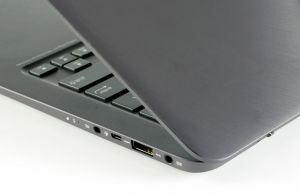 You’ll get three full-size USB slots on this laptop, a card-reader, the headphone/microphone jack, the PSU on the right and a micro-HDMI port as the only video-output option. Asus includes an USB to LAN adapter in the pack, but no mini-HDMI to HDMI adapter, so you’ll have to buy one yourself if you want to output content onto a bigger screen. Overall, this laptop is pretty impressive. It’s thin, light, fairly compact and well built. The hinge feels somewhat weak, the edges are sharp and some surfaces are prone to scratches and smudges, but if you’ll treat it well, it should prove reliable. I’ve also looked through the impressions posted online on the previous UX305LA, and there are very few complains on the build quality and reliability, which is great news if you’re aiming for this updated model, which is identical to the UX305LA on the outside. Let’s talk about the screen. The UX305UA is only available with matte panels and does not come with a touchscreen. If that’s a deal-breaker for you, look at the UX303UA or somewhere else. For me, however, this is one of the main selling points, as the option for good 13-inchers with matte displays is rather limited these days. Asus offers the laptop with either 1920 x 1080 px (FHD) or 3200 x 1800 px (QHD+) IPS panels. Both are solid options, with the latter being sharper and brighter. Our review unit comes with the QHD+ display, and you can find all the technical details and our test results listed below. 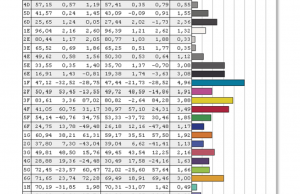 Average DeltaE: 1.84 uncalibrated, 1.66 calibrated. 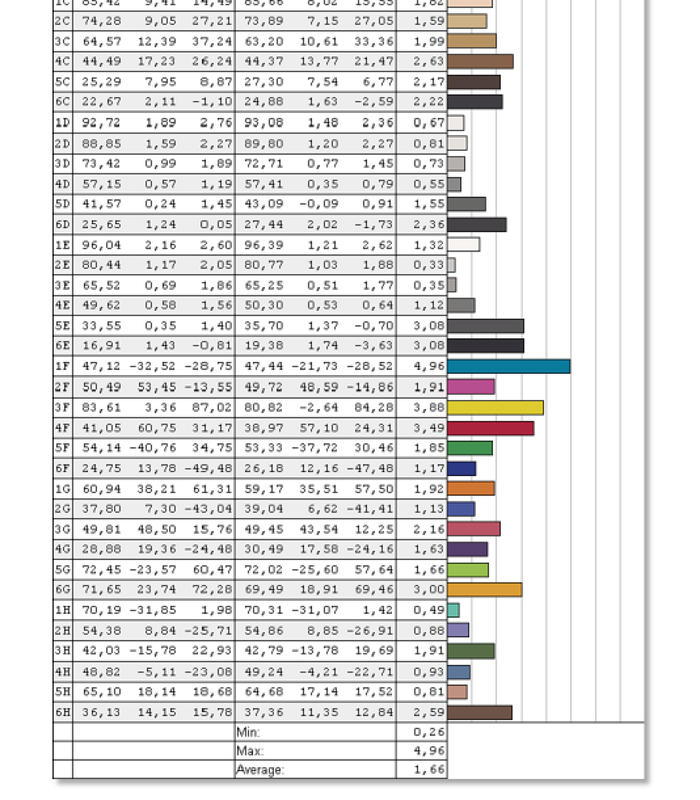 You can see that the colors are fairly well calibrated out of the box and both the gamma and the White point are very close to ideal values, but you can still find our calibrated color profile here. I do have to mention there’s some light bleeding around the edges on this unit. It is caused by poor craftsmanship of the plastic bezel around the screen, which presses on the panel in several different points. It was only visible on dark backgrounds when the screen’s brightness was set high (above 200 nits), so it wasn’t something I noticed in daily use. Light bleeding has been reported on the older UX305LA as well, but it’s pretty common on matte IPS builds and not something you should worry about, unless you get really unlucky and get an unit with really bad bleeding, in which case you should just return it. Besides this, keep in mind that you won’t be able to utilize a 13-inch 3200 x 1800 px panel with 100% scaling, as everything is going to look minuscule. That means you’ll have to use the scaling options in Windows and most interfaces and modern pieces of software scale well. However, third party programs and older software does not, which results in either blurriness or again, tiny elements and fonts. 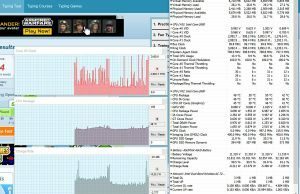 If you plan to use such older software on your computer, you should consider the FHD panel instead. In some markets the screen options might be conditioned by the other specs. Asus usually bundles the FHD panel with the lower-end versions of this laptop, while the higher-end specs are paired with the QHD+ screen. So if you want a Core i7 processor for instance, you might be forced to get the high-resolution display anyway. 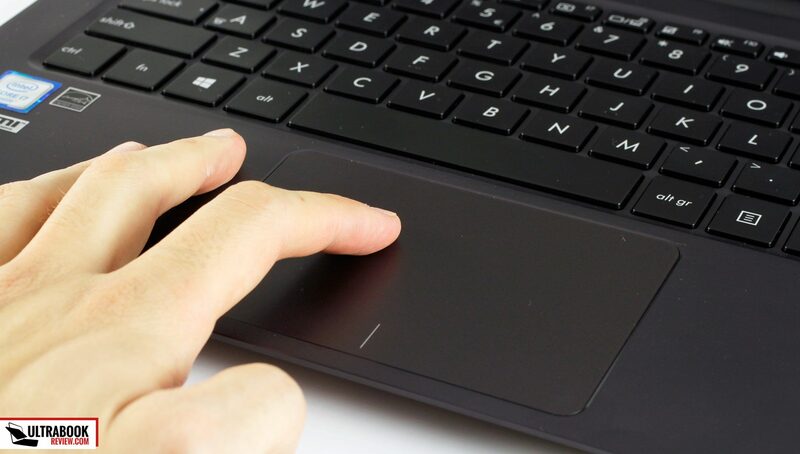 Where your hands go you’ll find a decent keyboard, with properly sized and spaced keys and an overall decent layout, except for two details: the tiny arrow keys and the Power Button integrated as the top-right key. 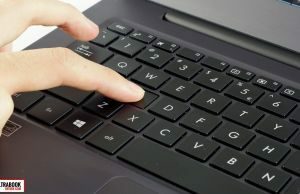 It’s a bit stiffer than the other keys, but you’ll still want to turn it off from Windows’s settings ( search for “Change what closing the lid does” and select the “Do Nothing” option). These aside, you must know that this keyboard is not backlit, which again can be a deal-breaker for many of you, especially if you’re already coming from a laptop with illuminated keys. Otherwise, you might not miss it much. But how about the typing experience? Well, like I said earlier, this keyboard types well once you get a hold of it, but the keys are shallow and just too soft for my liking. 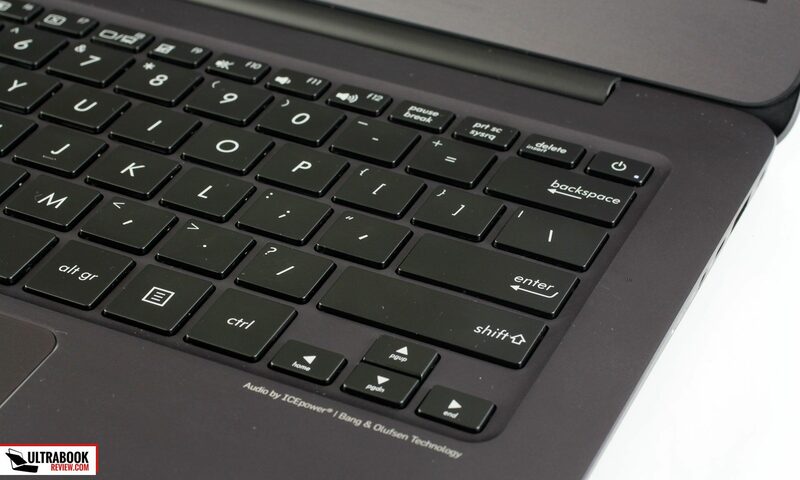 I’m actually used to short-stroke keys, as the keyboard on my XPS 13 is even shallower than on this Zenbook, but even so I never got to feel comfortable with the feedback provided by this one, not even after typing several thousands of words on it. 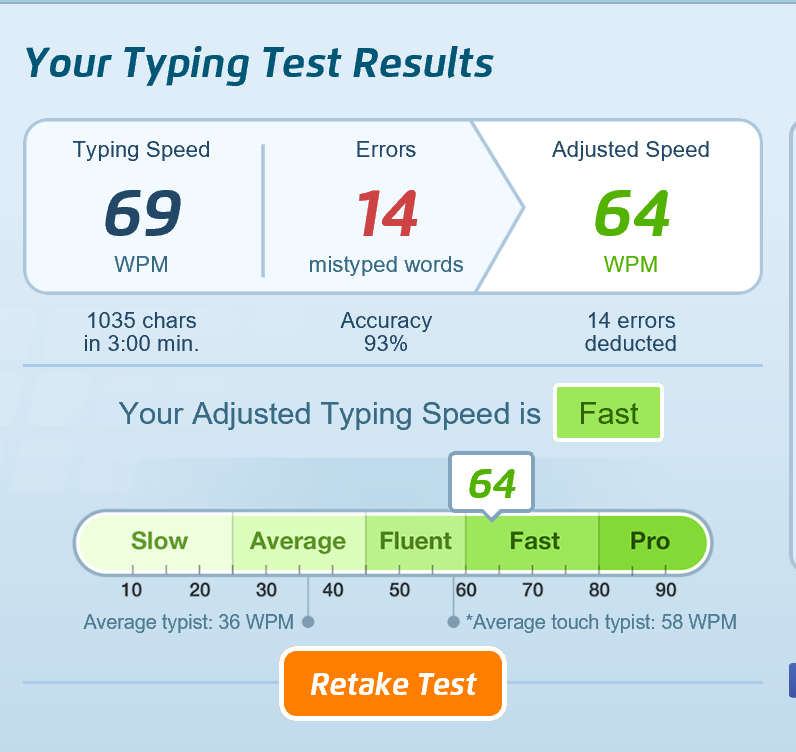 It’s a bit difficult to explain this, but besides what I mentioned above, the click response is not very precise, which meant that I had to adjust my style and hit each key harder, which had a negative impact on both accuracy and typing speed. 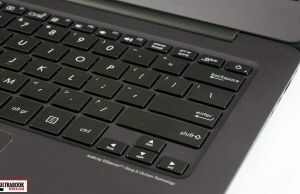 On the other hand, the keyboard felt really quiet, even the Space key, unlike on the UX305LA tested a while ago. Now, do keep in mind that I type for a living and I have high requirements and expectations from a keyboard. That being said, the keyboard on the Zenbook is not bad at all and most of you will be happy with it, but if you plan to do a lot of typing on it, you might want to look elsewhere. 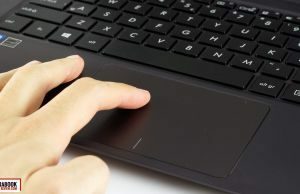 As for the trackpad, is spacious, has a nice beveled ridge around it and a smoother texture than the palm-rest around. It’s also responsive and accurate most of the time, even when having one finger on the surface and sliding with the other. Gestures work really well, from the standard two-finger scrolling and zooming, to the three finger Windows 10 gestures. I don’t usually use these, but I’ve tried them out for the purpose of this review and there’s really nothing to complain about. Now, I do have a few minor nits with the trackpad though. It’s an Asus TouchPad and that means the software offers very little customization options. You can adjust the cursor’s speed, but you’ll have to fiddle with it to find the right balance between speed and precision. However, there’s no way to adjust the tap response, and as a result light taps aren’t always recognized. That means you’ll have to use physical clicks quite often, which are stiff and clunky. Overall though, the trackpad on my test unit performed quite well. A lot of people complained about the trackpad on the Zenbook UX305LA and to be frank, my experience with it has been good on both the UX305LA and the UA models, so I can’t tell if other users just have higher expectations or Asus has some quality control issues and some units get crappy trackpads. All these aside, let’s see how this laptop performs in daily use. 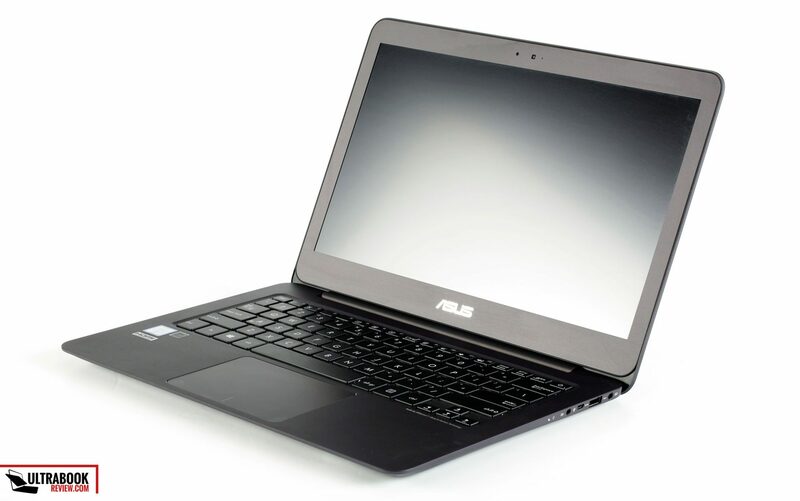 Our test unit is powered by an Intel Core i7-6500U processor, 8 GB of DDR3 RAM and a 512 GB SSD. 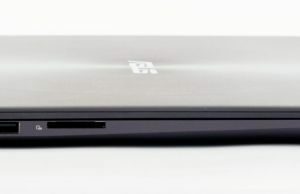 Some of the other versions can be paired with a Core i5-6200U processor for the base-level configuration and can get between 128 and 512 GB of SSD storage, but otherwise are all identical. 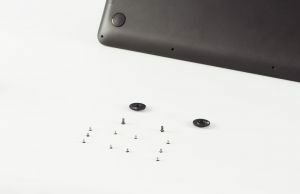 The storage can be upgraded, and for that you’ll have to take-out the back panel, which is hold in place by a few Torx screws and two extra Philips screws placed under the rear rubber feet. It’s an easy task, but it will probably void warranty, so do it on your own risk. 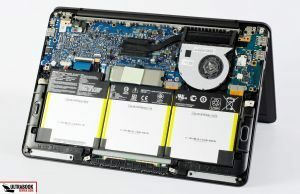 The laptop uses M.2 SATA 80 mm SSDs and PCIe sticks won’t work from what I know right now (let me know if you’ve seen evidence that PCIe SSDs are supported). The Wi-Fi chip should be upgradeable as well, but it’s placed behind the motherboard, so it’s more difficult to get to. The RAM and the CPU are soldered on the PCB and cannot be upgraded, so you’ll have to settle for what you pick in the beginning. 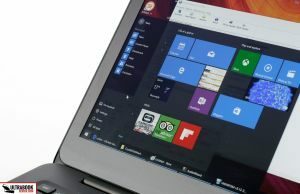 Specs aside, this laptop feels snappy in daily use, but you should take care of the software preinstalled out-of-the-box if you want to speed up the experience even more. There’s not a lot of crapware, but you should still get rid of McAfee, the Office and Evernote trials and even some of the Asus programs. Also, keep in mind that while the SSD included is miles faster than a regular HDD, it’s not as fast as some of the more modern SSD solutions available these days, with rather limited write speeds, but I doubt that’s going to bother most of you. Regardless, browsing with multiple tabs open, Office tasks and any sorts of multimedia content are a breeze for this laptop. In fact, if you plan to get it for such activities, I suggest picking a Core i5-6200U configuration, which is going to be fast enough and more affordable. 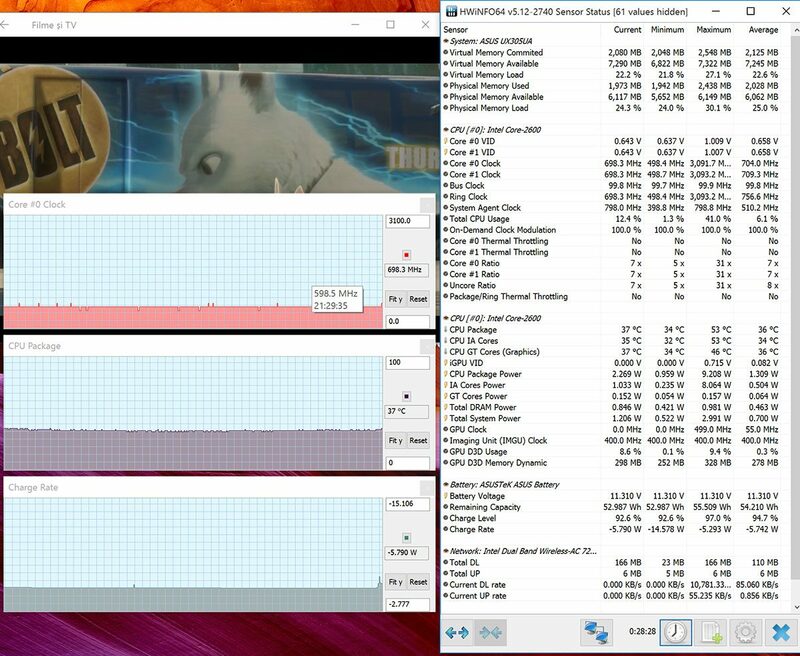 x264 Benchmark 4.0 32-bit: Pass 1 – 110.58 fps, Pass 2 – 20.94 fps. 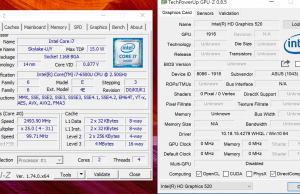 The Cinebench OpenGL and CPU-Single Core are a bit lower than what the Core i7-6500U processor usually scores, but everything else is just as expected. The Intel HD 520 graphics integrated within the Skylake processor are fairly capable as well, so you should be able to occasionally play older games on this computer. If that’s something you’re interested in, I once again suggest getting the FHD screen over the QHD+ variant. You’ll find some gaming scores below. Overall, our test unit performed very well. 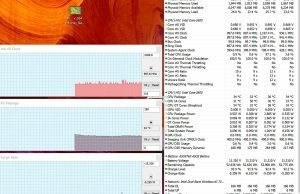 The Skylake dual-core platforms are more than capable of providing a buttery daily experience right now, when paired with 8 GB of RAM and SSD storage. I did ran into Display Driver crashes quite often, once or twice an hour, mostly when browsing and watching video, but not when running games. It causes the screen to freeze and go black for a few seconds, and then you might have to reload the tab you were in or restart the video. This can get annoying, but it didn’t have a major impact on my experience. Still, I noticed many people complained about similar crashes on the older UX305LA and it looks like this issue hasn’t been addressed on this newer version. Not a deal breaker, at least not for me, but something to keep in mind. 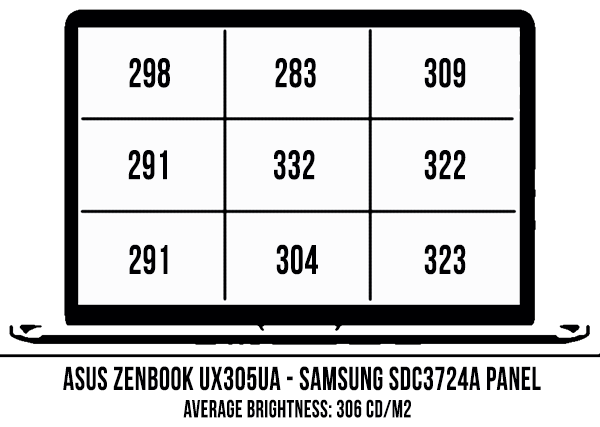 I like my laptop cool and quiet, and the Zenbook UX305UA checks one of these boxes: it runs very cool, both in daily use and under serious load. It’s not as quiet as it could be though. There’s a fan inside, which tends to kick in quite aggressively, even when performing casual activities like watching a Youtube clip or browsing between a few different tabs. It’s not always on and once it starts spinning, it won’t run for long if you’re using the computer lightly, but I’d prefer it won’t kick in at all with these casual activities. Especially since then fan’s lowest speed is fairly audible in a quiet room (38-39 dB at head level). 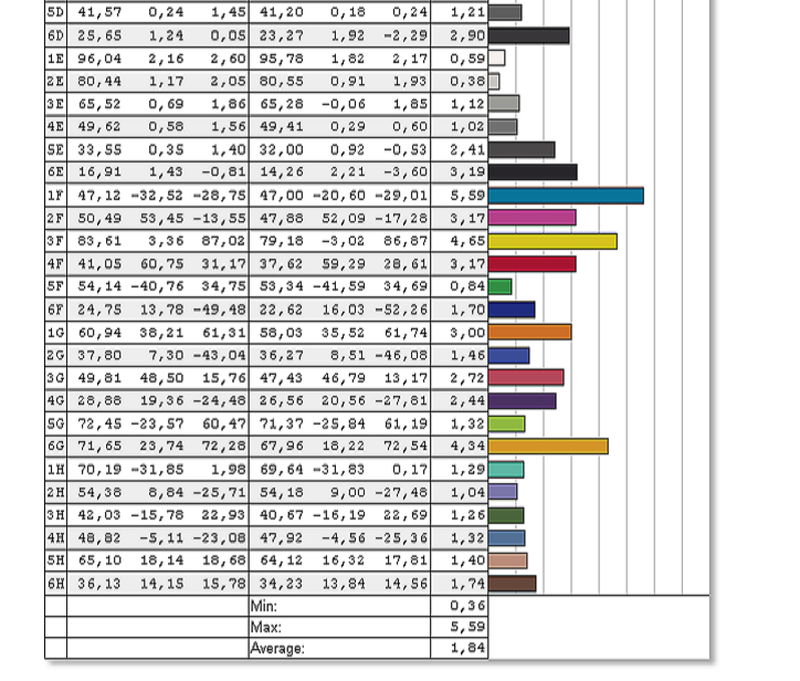 Under load, it actually gets noisy, around 45 dB at head level, but both the inner and outer temperatures remain low. I don’t really mind the high-load noise, but I do in daily use, when I don’t have sounds coming out of the speakers, that could cover that noise. 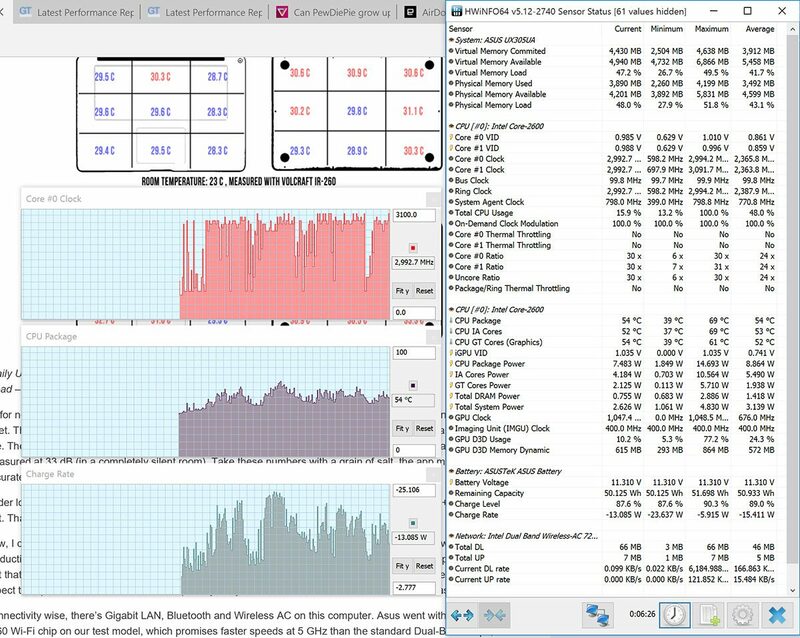 In comparison, the Dell XPS 13 does run hotter, but I only get to hear the fan once or twice a month with how I use the computer, and that’s what I’d expect to be the norm. Even when the fan kicks in, it’s barely audible at low speeds. 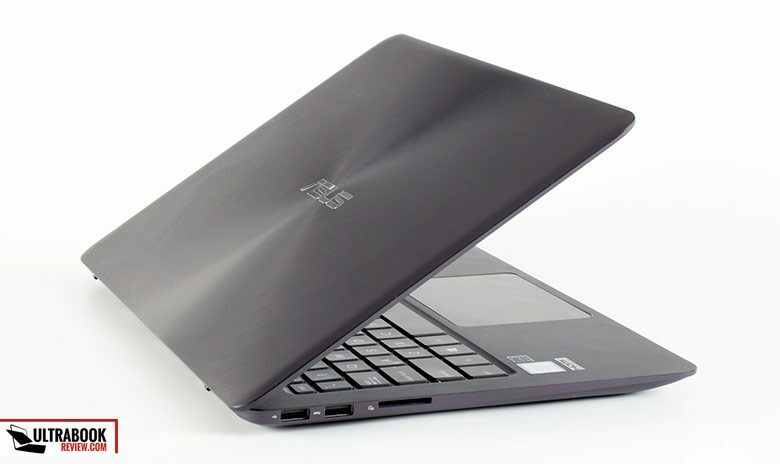 With the Zenbook, the fan kicks in several times every hour, and when it does, it’s noisy enough to become annoying. That for me is a real issue, because I know that it doesn’t have to be this way. Most tasks don’t require much in terms of processing power, so it’s up to the OEMs to implement a cooling solution that remains silent as much as possible. Asus failed at it here. Let’s move on and talk about the speakers, which are pretty good. They’re loud enough to fill a mid-sized room, topping at about 85-86 dB at head level, yet not as loud as the speakers on the XPS 13, which actually packs some of the better audio in the class. The sound coming out of them is on the tiny side, but can be improved with the AudioWizard presets. Connecting a pair of headphones helps a bit as well, but the audio exit lacks the volume and especially the clarity delivered by the XPS 13. 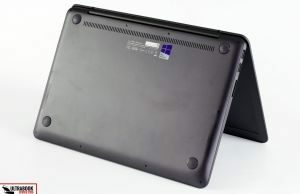 When it comes to connectivity, this laptop offers Bluetooth, Wi-Fi AC and a wired connection via the included USB to LAN adapter. 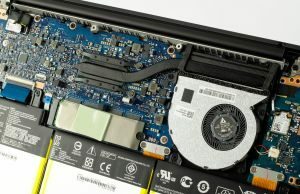 Asus went with an Intel 7265 AC Dual-Band module, the same one as on the previous UX305LA. In the 7 days I’ve used this laptop i haven’t ran into any problems with it, any drops or disconnects. I’ve only used it on a 2.4 GHz network during this time though. The chip is also a good performer when in close proximity of my router, reaching speeds of 100 Mbps, but they drop to only 30 Mbps at 30 feet with two walls in between and even further after that. So if you have poor Wi-Fi signal in your home or office, this laptop might not deliver for you. I have to add that I’ve read countless complaints about the Wi-Fi issues people had on the UX305LA: the chip disappears from Control Panel and a restart is required, Wi-Fi and Bluetooth don’t work well at the same time, etc. 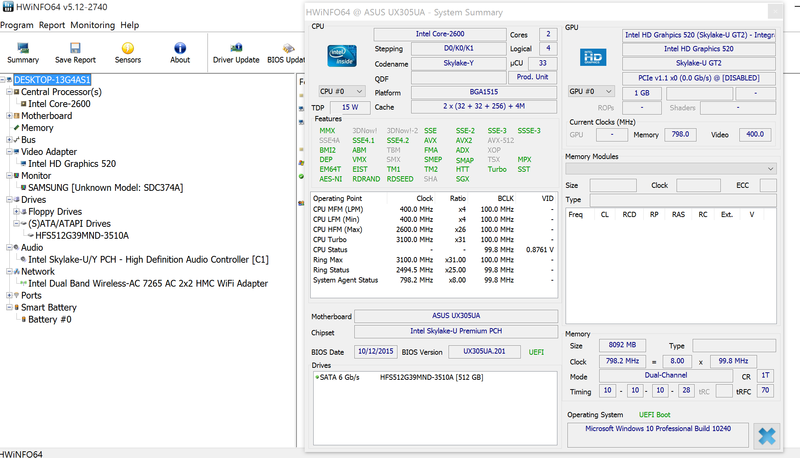 I haven’t encounter them in my experience with this UX305UA, so Asus either fixed the drivers with the upgrade to Windows 10, or perhaps I was one of the lucky ones and the issues are still there on some units. Hard to tell right now. The high-resolution screen takes it toll on the battery life results, and I’d expect the FHD configurations to last quite a low more. 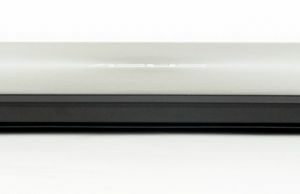 The laptop is bundled with a compact 45 Wh power brick and a full recharge takes about 2 hours and 30 minutes. The Zenbook UX305UA is available in Europe, Asia and some other regions at the time of this post, but not in the US or Canada. Update: The Zenbook UX305UA is available right now in the US and sells for between $750 and $800. Follow this link for more details and up-to-date prices at the time you’re reading this post. In Germany, the base model with the Core i5-6200U processor, 8 GB of RAM, 256 GB SSD and the FHD screen retails for 999 EUR. Higher specked versions get a Core i7-6500U processor, 512 GB of storage and the QHD+ screen and sell for up to 1399 EUR. 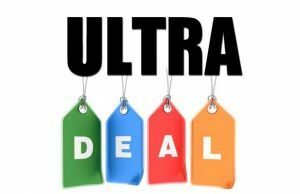 In the US you can find the Zenbook UX303UA at the time of this post, for as little as $850 , a Skylake laptop with a touchscreen and a backlit keyboard, but in a slightly larger and heavier body. 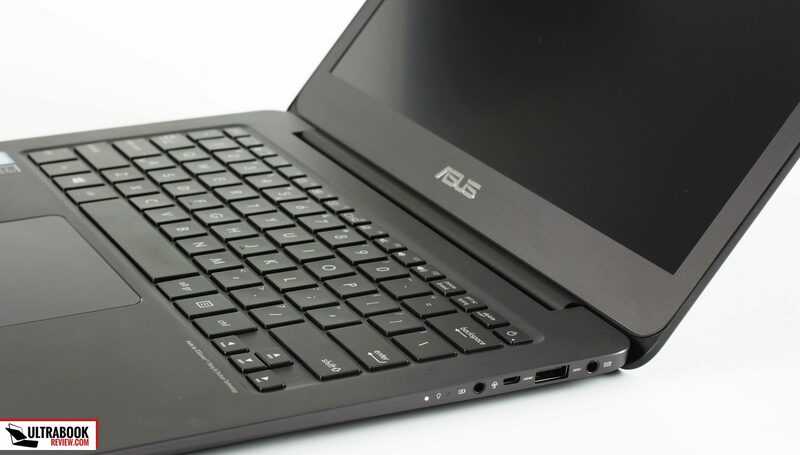 The UX305 model is usually affordable than the UX303 version, hence we can assume that Asus will have the UX305UA starting at around $799. Till that happens, there’s that UX303UA as the alternative, but also the older UX305LA, which sells for around $750 these days (more details in here) and is identical to the UA variant, except for the fact that it’s built on Broadwell hardware. Now, I can’t tell you when or even if the Zenbook UX305UA will be available in stores in North America, but I’ll update this section when I’ll have news. At the end of the day, the Zenbook UX305UA is a solid 13-incher with one serious ace down its sleeve: its affordable price. It’s also a very nice looking and well built machine, gets an excellent screen, performs just as it’s expected from a Skylake-powered device and goes on and on each charge, thanks to its large battery. It’s not going to be the ideal pick for everyone though. It doesn’t get a touchscreen and lacks a backlit keyboard, so you should only get one if you can live with these two aspects. There’s also room for improvement in the keyboard department, you’ll have to spend extra for some adapters, as the IO is limited, and it doesn’t run as quiet as some of the other ultraportables built on Skylake Core U platforms available these days. 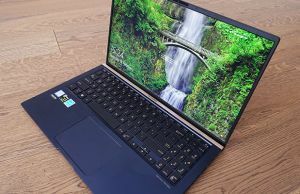 But it’s more affordable than the competition, which is pretty much represented by Dell’s XPS 13 series (our review is here). 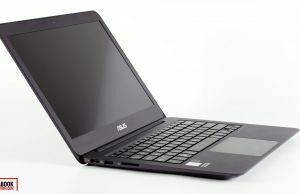 This one is more compact and even lighter, is overall a little sturdier built, runs quieter and gets a backlit keyboard. It’s also much quieter, albeit hotter. 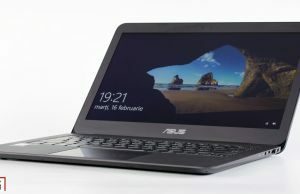 However, in Europe a Core i5-6200U config with 8 GB of RAM and 256 GB SSD retails for 1299 EUR, 300 EUR more than the Zenbook. 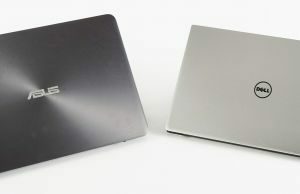 In the US it sells for $1199, while the Zenbook goes for as low as $749. In the meantime, you can still consider the Zenbook UX305LA, the UX303UA or you can check out some of the other solid 13-inch ultraportables available in stores these days. 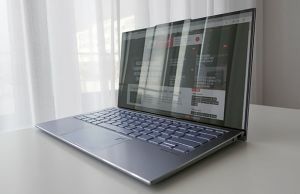 The Zenbook UX306UA is another unit you should have on your list, as it is the upgraded version of the UX305, meant to replace it starting with the second half of 2016, and the Zenbook UX330UA is another successor worthy of attention, as a more premium option with fancier looks and improved build quality. If you’re not in a hurry though, wait for the UX305UA update. If any of you know anything about its release date in North America, let me know in the comments section below, where you can also post your questions and opinions of this product, I’m around and will reply if I can. would you recommend this over the xps 13? I can get the xps 13 (i5 6200u, 256gb ssd, 8 gb ram, fhd matte) for 1300€ or the ux 305 (i7 6500u, 8gb ram, 256 ssd) for 1099€. Also i dont understand why the battery lasts longer watching a video (1080p mkv) than browsing. Well, you’d have to be the judge of that, based on how much you want to spend and what matters for you in a laptop. The XPS is smaller and slightly lighter, gets a backlit keyboard, somwhat better keyboard imo, the UX305 is cheaper and gets a better trackpad and slightly larger battery. I finally bought the ux305, I’ve been using it since Saturday and I’m really liking it. Thanks for the review! hi andrei would you recommend the UX305 over the HP envy 13 (i5 6200u, 8 gb ram, 256 gb ssd, fhd) i can get the hp for 1000€ while the ux305 (i7 6500u, 8 gb ram, 256gb ssd, fhd) for 1100€. The Envy gets a smaller battery and isn’t as sturdier built as the Zenbook, but on the other hand gets a backlit keyboard and improved IO. Tough to say which one is the better pick, you’ll make compromises with each of them, it’s up to you to choose which are the ones you can live with. 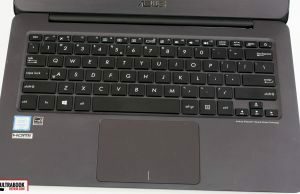 Personally, the lack of a backlit keyboard on the Asus is a deal-breaker for me. i would suggest the asus. When i bought the UX305 i saw the envy, its beautiful but the bezels looks bigger than the ones in the UX305. The keyboard travel is shorter also. The good: backlight and the function keys always on. It would be very usefull to know the difference in battery life between FHD, QHD and Touch display in various type of use like you have tested in this article. Personally when I travel, I have bad quality generator electricity availabe only 5hrs per 24hrs, which mean no electricity during a day time. Well, from my experience, there’s not a big difference between a touch and a non-touch panel, given they are both similar in terms of resolution and panel type. higher-density panels require a bit more energy, but the difference is 1-2 W between a FHD normal gamut panel and a UHD wide-gamut one. There are exceptions. Im still on the way to replace my old Lifebook P770 and Latitude E6400 with one new ultra portable workhorse and your articles are doing great job what other sites and articles doesnt do. Seems that “perfect” choice for laptop is hard to find. All laptops lack one or two of most important qualities, size, too wide bezel, small battery capacity or small hard disk, no back lit kb etc. 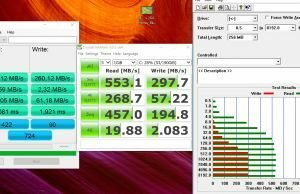 Often no 512MB or 1TB M.2 SSD available and it need to be replaced by the consumer. 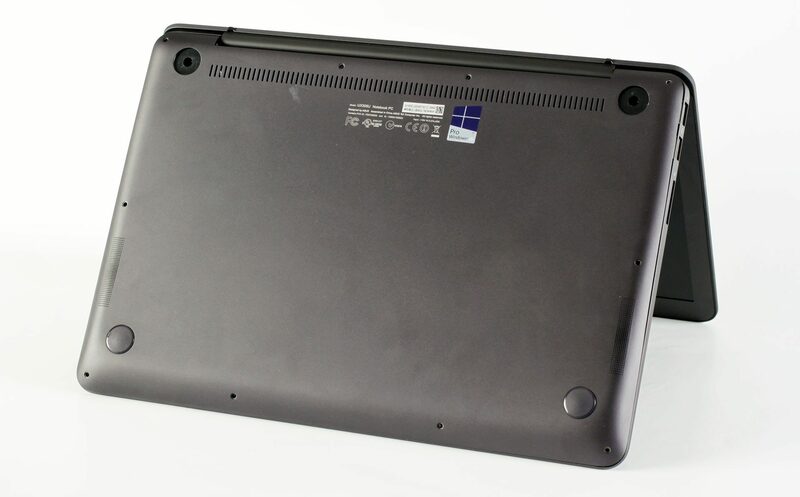 So my question is do you know does this laptop, also another reviewed laptops host M.2 2280 Single or Double side sticks (S1-S3 and D1-D5), or do the expansion slot accommodate narrower nor shorter length of sticks? In other words, is it safe to just buy SM950 Pro and it will replace the original just like ATA and SATA drives do? 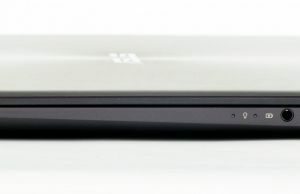 Not sure if I got right what you were asking, but this laptop comes with an M.2 2280 SSD. In theory, a shorter stick should fit, but you wouldn’t be able to fix it with a screw and I can’t tell for sure if it’s compatible. Also, the 950 Pro is an NVMe drive, while this laptop only works with SATA M.2 drives from what I know, so the 950 shouldn’t be compatible. Hi Andrei thanks for your review ! Are the hinge and the fan noise the same as they are on the UX305LA or are they worse ? Thanks for your help ! Yes, pretty much the same from what I can tell, although I don’t have the ux305LA around to do a side by side noise comparison. andrei one question, does it damage or affects battery life if i leave the laptop plugged in even if it reaches 100%? 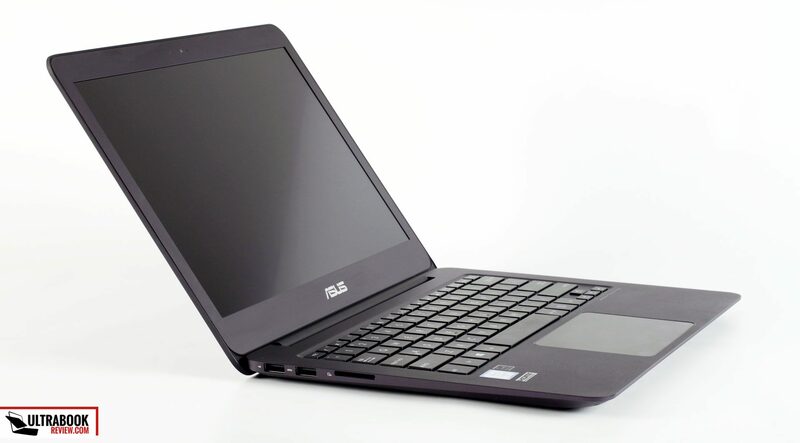 I don’t play games and I’m looking for nice ultrabook but since I can’t afford to get Dell XPS 13 I guess I will stick to one of those ASUS 305.Question is which one? 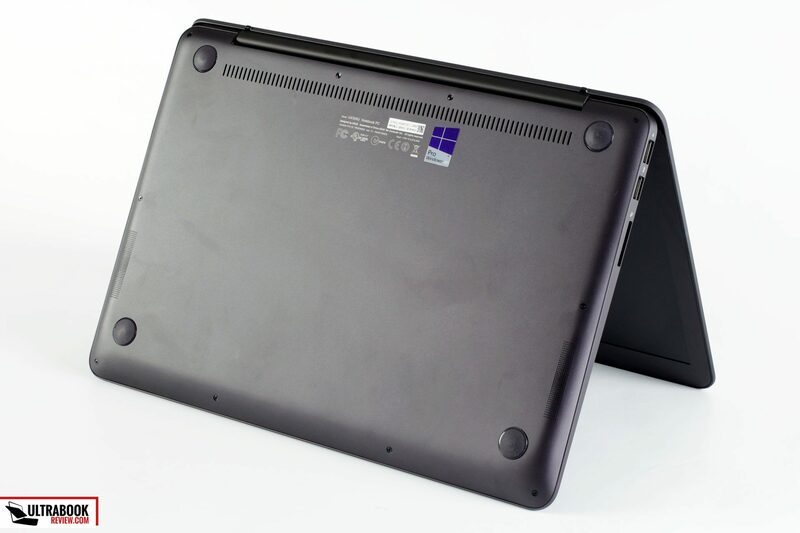 The UX305CA is the fanless one, built on Skylake Core M hardware. It’s also a bit thinner and lighter than the UX305UA, which is built on Core U Skylake processors. The Core M version is going to be slower than the Core U models, but quieter. 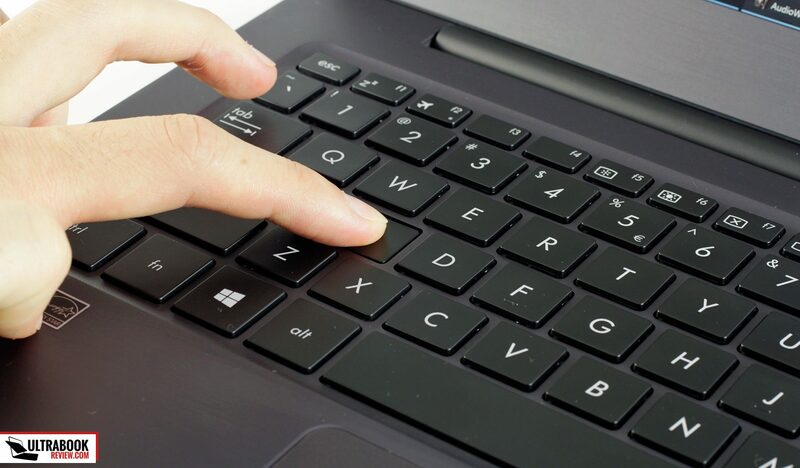 Backlit keyboards should be standard in 2016 and with this price. What would you recommend for a small 11-12 inch 2-in-1 machine solely for note taking – a digital pen is definitely a plus, but not absolutely required. Nothing fancy 128GB of SSD would be sufficient. 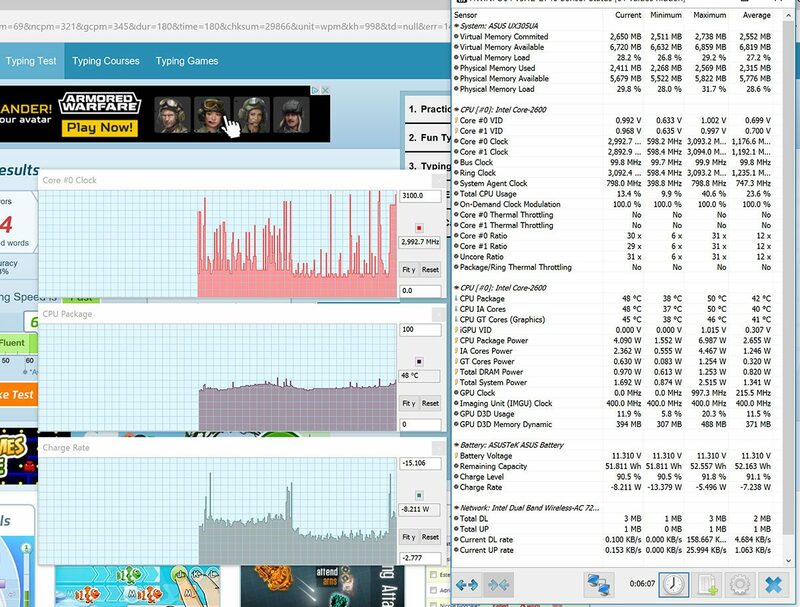 No need for a super-fast CPU or GPU as the most it’ll do is some light browsing and some office documents. 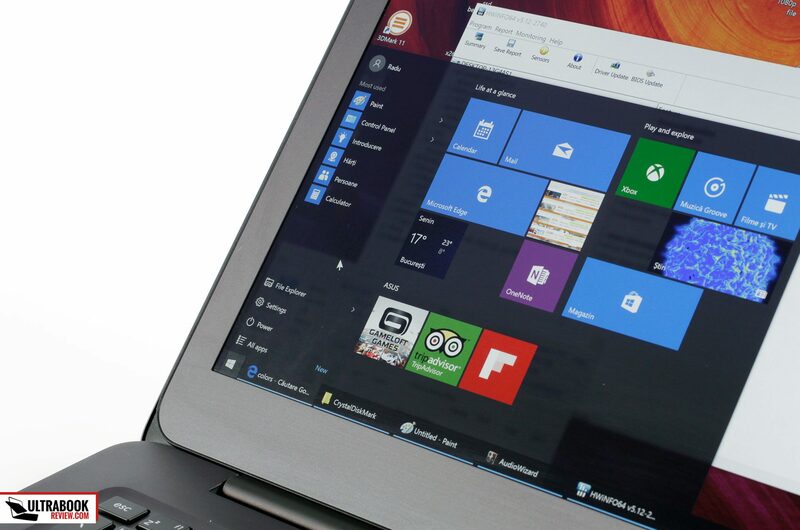 A normal Windows OS is a must – i.e. Windows 8 or 10. I’d go for the Surface Pros, but not sure if they’re withing your budget. I see from other website that the machine’s hinge have some problems. is it true based on your observation? Hi, do we know when this will be made available in US, north america? It is available now, at least on Amazon it is. I tried going on the Asus website to see if I can get it from there, but it wasnt showing up there? Good to know about that fan. I hate cooling fans. Got a zenbook prime with touchscreen. 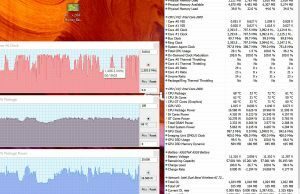 That fan wont stop even when using notebook fancontroll. And tuning the settings. Its a i5 3337u cpu. Seriously nice looker this Zenbook. 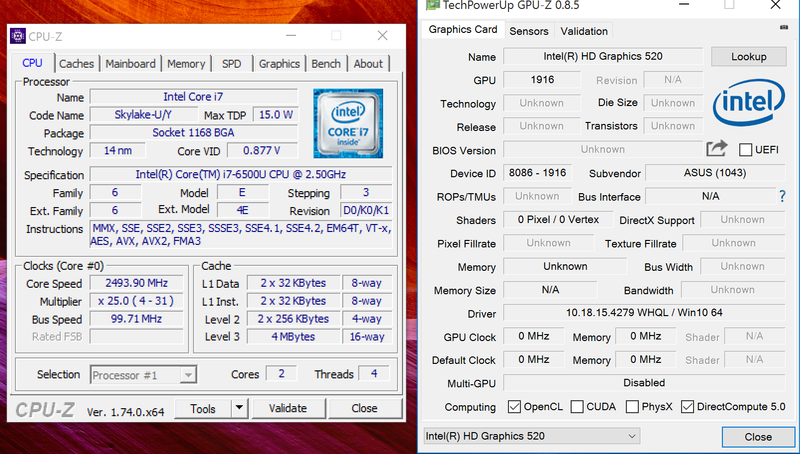 But performancewise meh..i keep it underperformed at 0.77 GHz. 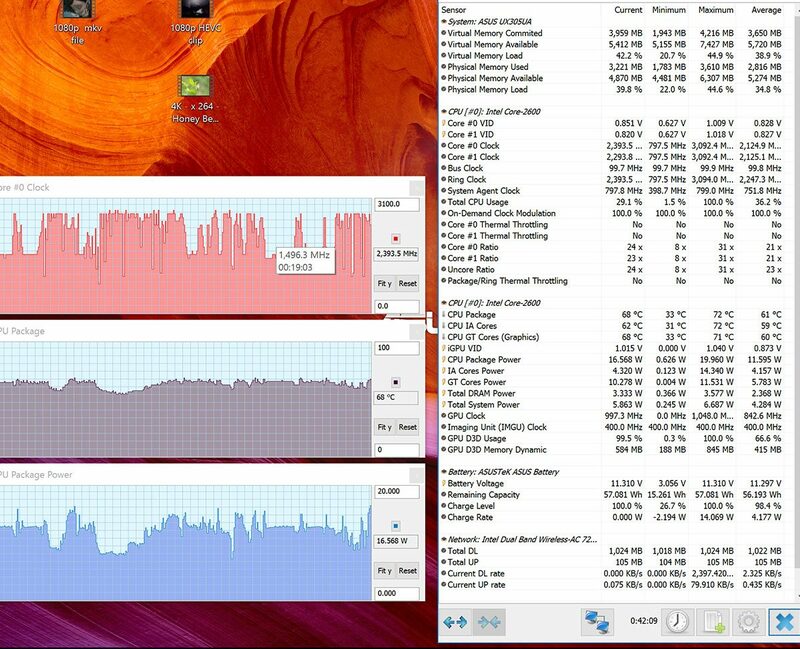 And even then the turbo funtion behaves erratic, thus heating up the processor fast. 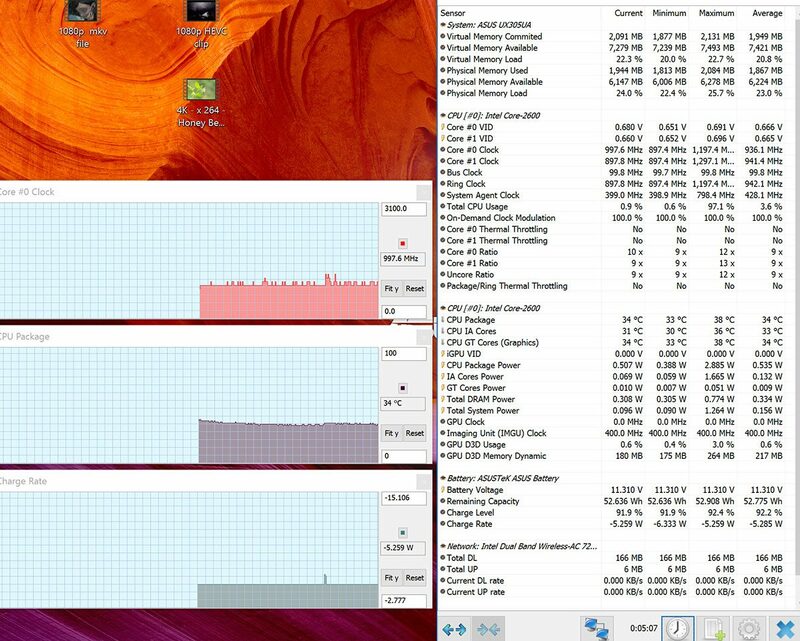 And asus built in a very poor cooling system that cannot keep the cpu cool for very long. 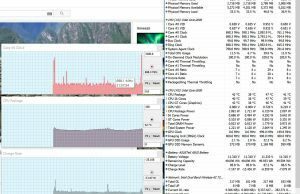 Seriously asus… Make damn sure you put in a adequate cooling system that can keep the cpu cool enough before the fan needs to kick in. Test the damn apparatus before selling it for 1000-1300$. A-holes! hi andrei im having trouble with my ux305ua, since a couple of weeks ago i cant close the lid of the laptop because then it wont wake up from sleep. Everything is working, i hear the CPU fan, and the keyboard lights (caps, airplane mode and power) are working but the screen is off. I tried everything but no luck. Do you know what could it be? Any update about this? I just bought a brand new UX305UA and I have exactly the same problem. Perhaps a BIOS update will fix it? I am having the same problem. Out of the box, it was okay. When Windows updated itself to the new build, the problem began. Temporary fix: change the settings from sleep to hibernate when the cover is closed. Asus technical support has not been able to provide me with a solution. They recommended updating the bios, but I have the latest bios. They recommended updating the Intel Management Engine Interface device driver (using an updated version from the website), but every time I’ve tried, the old driver kept appearing. Now they are recommending a Windows reset which is a real pain. If that does not work, I have to return the computer. Nope, i am in the latest insider build and still no fix. I updated the intel Engine(…) and still no luck. I tried a couple more things like turning off the fastboot, etc (basically everything i found on the internet) without any luck. I noticed that in the uninstall or change program window, it appears that the latest version of the Intel Management Engine Interface is installed. But in the device manager, it shows the old version of the driver. I’m not sure what that means, but that could be the source of the problem. I sent the installation logs to Asus tech support, but I have the sense that they won’t look at them. 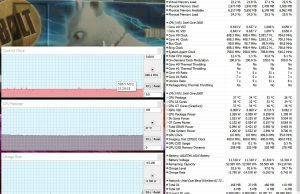 I've written to ASUS about this problem, let's see what happens ..
"Standby / energy saving / suspend to RAM / sleep mode does not work properly any more on my new UX305UA. It did work correctly in the beginning, but after installing the latest Windows 10 updates (especially the 1511 update), standby / energy saving / suspend to RAM / sleep mode does not work properly any more, as it did before. Waking up the device, the screen stays black and you have to reboot. Only suspending to disk / hibernation works fine. 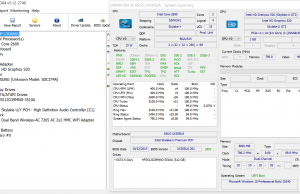 I'm on the newest (and only available) BIOS 201, I've updated all drivers to the newest version available by ASUS (asus.com/support/Download/3/747/0/4/3VmVuwyoh7pPv8Dc/45/), I have even tried to update all Intel drivers (Graphics, WIFI, Bluetooth, Intel Management Engine) to the newest versions available by Intel. I have even reset Windows 10. The problem persists, the screen stays black after waking up from sleep / standby. This is a major problem and makes the notebook unusable for me. I'm not the only one having this problem, there are at least 4 other people I could find on the Internet. 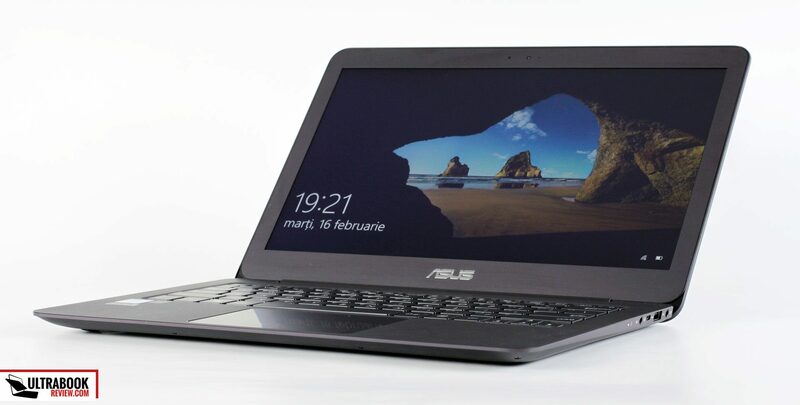 Please check threads and comments made on http://forum.notebookreview.com/threads/asus-ux305ua.792652/ and on https://www.ultrabookreview.com/10058-asus-zenbook-ux305ua-review/. Looking forward to a solution." I’m having the same problem. I thought i narrowed it down to the intel graphics driver – i re-installed the original version form the Asus website and the problem went away. Just the other day it started doing it again so i re-installed old driver again (I hadn’t upgraded it) but problem wont go away now. I’m getting very irritated by this now….Its done it from day one. I nearly RMA’d the unit but was happy to live with the older driver fix but now I stuck again. installed them and sleep/wake now works fine. 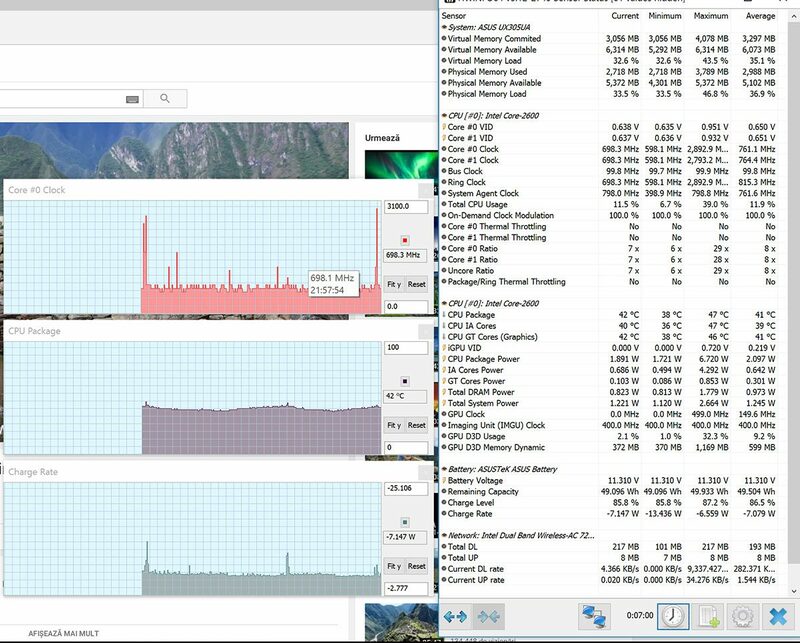 Note I also left the winstat option checked too. I had a same problem and I’ve fixed it. Thanks Andrew!! Installer detected newer version of the video driver and deleted it before installing the oldest version. Andrew, Your solution worked for me. In looking at the properties of the video driver, I noticed that the version on my laptop was installed after I received the computer. This must have happened when Microsoft automatically installed a new build of Windows shortly after I received the laptop. I downloaded and installed the older version of the video driver from the Asus website and the problem resolved itself. (During the installation, I received a warning the I was replacing a new driver with an older version. I proceeded nevertheless.) I suspect that the problem will reemerge when Window does another update, so I’ll need see if automatic driver updates can disabled. Based on what I’ve read, Intel video drivers are tweaked by manufacturers to work with their computer models and problems can occur when generic drivers are downloaded from Intel’s website. If that’s the case, then Microsoft’s automatic updates of Windows can cause systems to fail or have problems. One would like to think that Asus support would know this or that they would be updating their drivers as Intel updates the generic version. But apparently not. 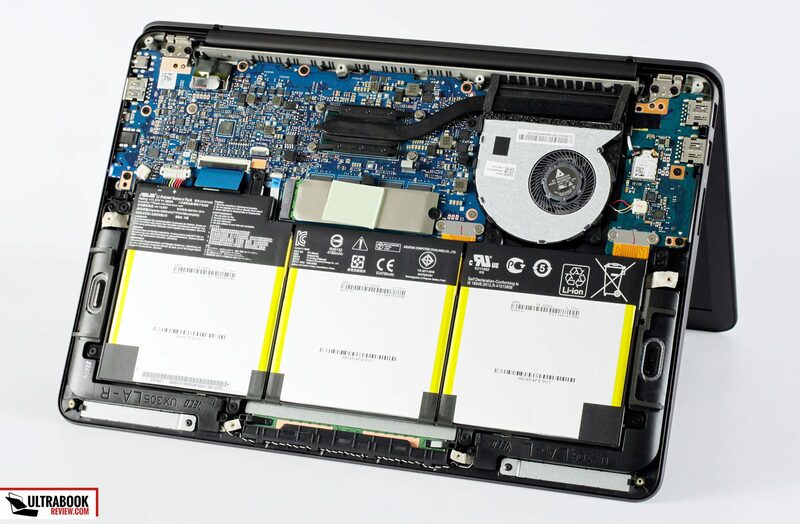 Hi, do you know if the other ASUS Zenbooks (specifically the 303UA suffer the same fan noise problems? I love the sound of the 305UA but wonder if the fan is a deal breaker. Not sure I’m keen on going to the Core M processor and compromising speed for quietness though. Well, the UX305UA is not that noisy, just to make things clear. 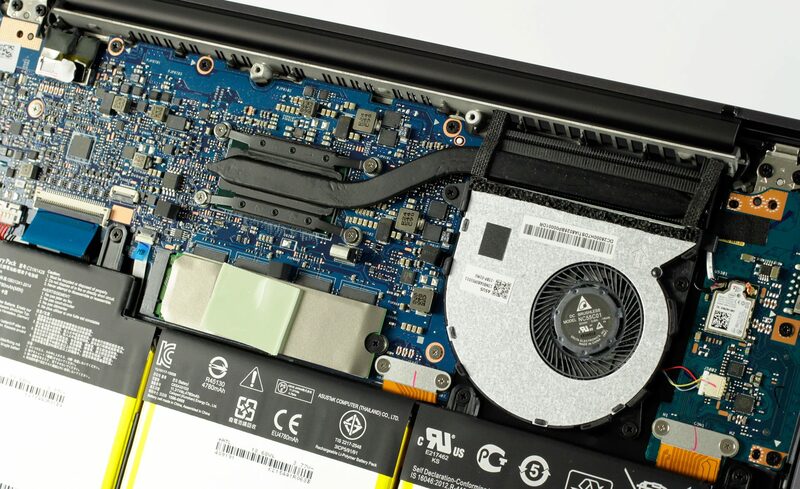 But given how other laptops are able to run on fanless cooling for longer, like the XPS 13, I think there’s room for Asus to make adjustments here, hence my complains. The UX303UA is a little thicker than the UX305UA, so there’s a chance they did a better job with that one, but there’s no way to be sure without testing it. And I can’t get my hands on one right now. I haven’t notice when 2 weeks past and I wasn’t bothered at all by any of noise that it could attract my attention, in the way that I would be annoyed. Maybe sometimes “it kicks” but I don’t even notice, hard to explain (since I do know “it kicks”) but you can barley hear it. Maybe I haven’t perform any demanding tasks yet, but since you are wondering about getting the Core M, I guess you are not thinking about gaming or doing any “crazy” stuff on it. Summing up, I have it almost a month and I couldn’t be more happy it. Hi Nakz. I know it’s not ideal, but it’s a workaround. Today’s laptops, with SSDs, boot fastly. You can try to at least hybernate your laptop instead of puting it at sleep (I assume that with sleep you’re talking about suspending it). Hi! At the moment, the UX305 UA is not available in my country. Stores only offer the UX305 LA with the 5th gen intel. Should I wait for the UA model? Is there a big difference between them? Also, I checked the review of LA on this website to compare it with the UA. The battery life on different loads when they are compared are inconsistent. At different loads, either UA or LA can last longer than the other. I think I need help understanding how this happened? Thank you. Hoping for a reply. The real benefits of the UA is the improved graphics performance and HEVC hardware decoding. Other than that, the hardware is mostly the same. Battery life results should be consistent, but results might be influenced by drivers. Also, keep in mind I’ve reviewed a pre-production versions of the LA and this might have caused some of the differences. Will it lag while playing game such as Dota 2 and GTA V? No for DOTA 2 (medium settings)but Yes to GTA V (all settings). Talking about fps here. You need to specify on the term lag. Do you mean latency between your network and you game, latency between your inputs and display or general frames per second. If you need to play GTA 5 without “lag”, consider getting a gaming notebook. 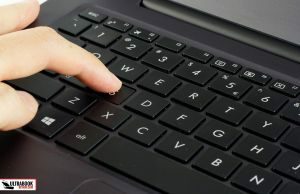 Do you research before buying a laptop (or by posting up a very broad comment). I have had a nightmare with laptops in the last year. Started with a 303la which I loved, ran quiet and cool, unfortunately the hinge collapsed after a month. Retailer swapped it for another which failed to boot up out of the box. Moved on to a HP Spectre 360 and had endless problems with black screen due to graphics drivers collapsing. Back to the retailer and came out with a Dell xp 13, nice machine but offensively noisy,fan would start up whenever using and charging at the same time,by the time I took it back it was coming on frequently, sometimes after only a few minutes light use. I have now come full circle and am looking at the 305ca and hoping the hinges have been strengthened. You should also known that Asus are going to renew their ultrabook lines in the next few weeks, maybe months. The UX305 will be replaced by the UX306 and UX330, the UX303 by the UX310. Might be worth waiting for those, if possible. hi! 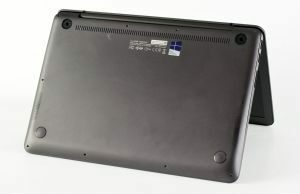 I’m planning to buy a laptop is this good for engineering softwares? how about the video card of this laptop? I’m sorry I’ve been relying on google searches and I want a lightweight and fast laptop for engineering. Big help for the reply, thank you! What kind of software would you run on this laptop? hi golda, I’m a engineering student who just finished the degree and will start a msc this October. I used matlab, Catia, solid works, latex, office software, etc without any problem. 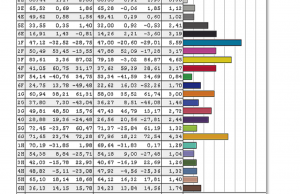 Don’t expect to play games at max settings, but for homework, video stream, internet, matlab and so on its perfect. 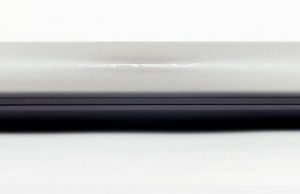 Lightweight, powerful, good battery, good keyboard and trackpad, good screen, good ssd speed… for me it’s just perfect. (I have the i7 6500u, 8gb ram, 256gb ssd). How will the gaming experience be if I tried to run Fallout 4, assuming I’m running the most basic version without any mods or whatnot. That said, how would it run with mods added? Hey, to everyone having the problem of the laptop not waking up from sleep (black screen after sleep mode), I installed the W10 anniversary update and now the problem is fixed. 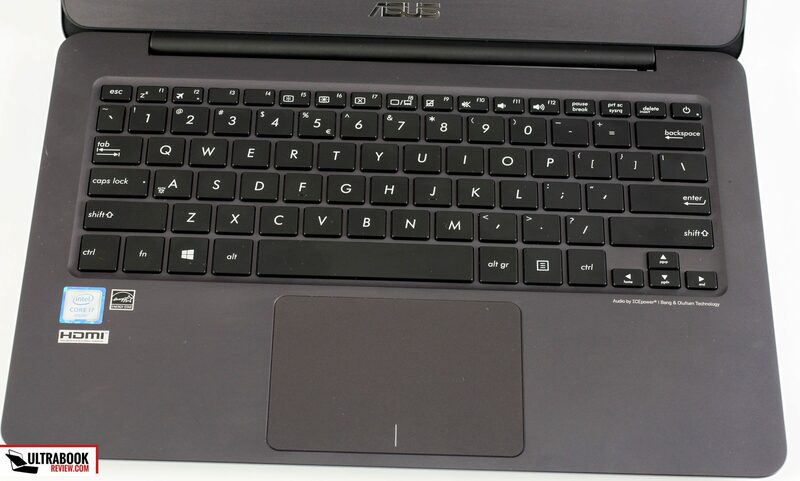 Does the asus logo has backlight? No, the logo is not backlit.